Just like everything else about our bodies, where we have sagging here or joint aches there, our vision changes with age. 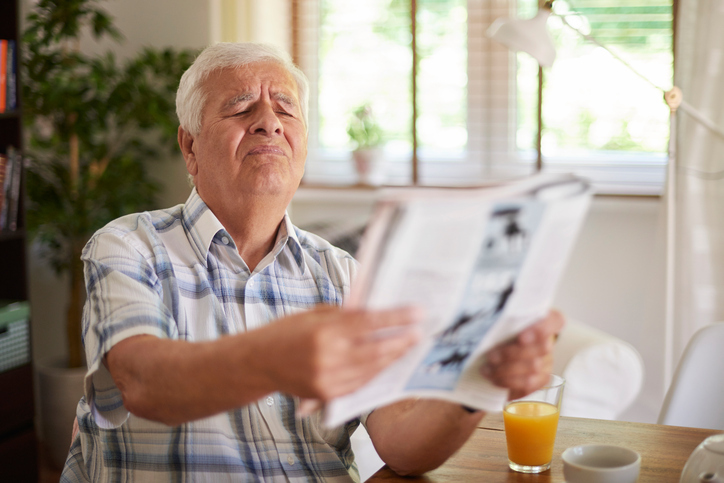 Some age-related eye changes, such as presbyopia, are almost universal and aren’t related to any disease. Cataracts are considered to be an age-related disease, but again, they are so common with people over the age of 60 that they are just normal occurrences. Unfortunately, there are some age-related eye diseases that occur more frequently as the years pass. These conditions include macular degeneration, glaucoma, and diabetic retinopathy. From routine exams (which should occur yearly starting at around age 50 to catch signs of macular degeneration and other conditions early) to cornea and retina surgery, to removing cataract-clouded lenses, we handle just about everything to do with your vision at Millennium Park Eye Center. So, for our patients, here’s a little timeline of what you can expect with your eyes and vision as the years go by. Things don’t change until we hit 40. The 40s — Presbyopia becomes almost universal sometime after we turn 40. This means our eyes have trouble with near vision focus. Hello, reading glasses. The risk of having dry eye or computer vision syndrome increases now, too. The 50s — Risks increase for cataracts, glaucoma, and macular degeneration. Often these show no symptoms until the damage is already done. This is why it’s important to have eye exams at least every two years. If you’ve shown any signs of problems, yearly exams are a good idea. Dry eye increases, especially with women exiting menopause. The 60s — Risks for the eye as mentioned earlier diseases increase significantly. Your ability to see in low lighting decreases. You will develop and understand more floaters and spots in your vision, especially when looking at a blank background such as the clear blue sky out over Lake Michigan. Yearly physicals are important to check for problems such as diabetes that can lead to eye problems. Also, while just about everyone develops protein globs in the interior of their eyes that create shadows on the retina (floaters), if they develop suddenly, that’s a problem that needs instant attention. The same is true with flashes. The 70s & 80s — By this point, research shows that four out of five seniors either have cataracts or have already had corrective surgery. Surgery to replace the clouded lens is the only treatment, and it is around 99% successful. Color vision declines. We also lose some peripheral vision by this time — the loss can be up to 30 degrees. Because of this, if you’re still driving at this age, you need to be extra careful as you can’t see potential accidents, such as a bicyclist entering from your peripheral vision, as early or easily as you once did. No matter your age, a healthy diet full of fruits and vegetables helps to give your eyes the nutrients they need to fend off some potential problems. Also, seeing the team at Millennium Park Eye Center is crucial to catch any problems early on before they can do serious damage. Call us at (312) 996-2020 to schedule your appointment.